"While most of our friends and family have been so supportive and helpful, I have been getting a lot of crap from people about our low budget DIY wedding. I was told just the other day that asking family/friends to help with things is 'rude...who asks their guests to work'. I couldn't help but feel disappointed because we want our wedding to be a celebration of our love and life together shared by those closest to us. As well as a celebration of the joining of our families. And what better way is there to do that then everyone coming together to make reception food, and 'arrange' flowers, etc." Hear, hear, dear Reader! I completely understand both your frustration and your hope. We wanted to have a budget wedding. There's no way we could have hired external vendors for everything and still stayed within our budget. 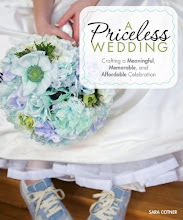 I don't find working with vendors all that fun, especially vendors who are accustomed to working on weddings. 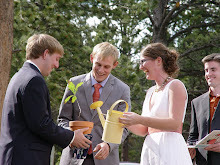 Their prices are inflated, and their investment in individual weddings often seems insincere. [Editor's Note: There are lots of quirky and cool vendors out there in craft-land who would be fun to work with. We just couldn't afford them.] Plus, we wanted to be immersed in our closest friends and family. For example, while I was getting ready for the ceremony, my good friend, Beth, was doing my hair, Marie was getting the ceremony drinks out of our refrigerator and putting them into the cooler, and Marsha was taking pictures of it all. It was like a slumber party! Our friends have a lot of unique interests and talents, and we wanted to showcase them. We speculated that people would feel more connected to the experience (and therefore enjoy it more) if they were truly part of making it happen. I, too, had fears that people would feel like the wedding was more of a chore than entertainment. Honestly, a couple guests flat out said no, they didn't want to help. Even my step-dad (who is a very helpful, amiable person) didn't want to be a chef (he's a great cook!) because he felt like he would be missing out on the action. For the most part, however, people were eager to help. We tried to break down each job into something small, so it wouldn't be too overwhelming. Then I wrote explicit and detailed instructions for each job (see below), so people could take it and run with it. I was worried that I would have to answer a bunch of questions during the wedding weekend, and that would have been stressful (like a doctor on call). Instead, the whole thing was pretty seamless. One of our friends picked up the kegs, set them up, and returned all the rented parts. I had paid for everything in advance, so there wasn't much trouble. 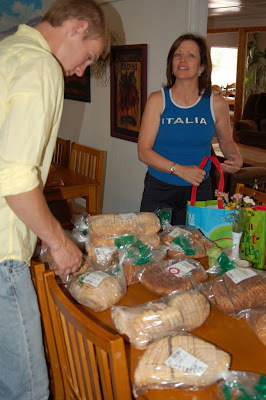 Another friend picked up fresh bread from Whole Foods on her way to the Welcome Picnic. Someone else picked up the pre-paid cakes on her way to the ceremony. Another friend took the margarita machine back to her house so the company could pick it up within their delivery area. There were lots and lots of jobs! For the people who took on bigger jobs, we tried to pay for their accommodations, so they at least felt compensated somewhat. Across the board, the feedback was very positive. 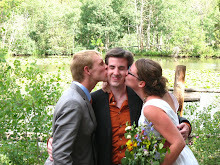 Noah, Frank, and Brian even said he enjoyed the wedding more because they contributed to it. Bingo! All the people at our wedding who would normally fall into the it's-rude-to-give-people-jobs camp noticed how amazing our friends were and said things like, "Wow, everyone really stepped up to help out." It created a truly communal and merry feel. I think the naysayers were surprised by how well our experiment with jobs worked out. The one job I regret was the fajitas chef role. One of my closest friends, Brent, took on the role. We purposefully set up the four grills in the main area, so he wouldn't feel separated from the group. However, the prep just took a lot longer than we anticipated (in part because our juicer broke, and Brent juiced something like 15 pounds of limes). It seemed like he gave up a significant portion of the Welcome Picnic to make the marinade. However, another dear friend of ours, Laura, helped out a lot, and they were working in the kitchen of the main lodge, which was pretty much in the center of everything. In the end, Brent still enjoyed himself, and everyone who contributed their labor to the wedding seemed to be the most invested and connected. It was way better than any registry gift! Our compromise is this: we're asking friends to do most everything, but the few jobs that happend during the reception we're hiring people for, so our friends can party. Ie: my sister is making all our paper goods, but we're not asking the pro-photographer best man to be the offical photographer (though I'm sure he'll shoot pictures) we hired someone awesome for that. It's a different balance then the one you guys struck, but it's working well for us so far. Also, I think it's really helpful to listen (like you did) when people say no. It's actually awesome when people say no, because you know they care enough to be honest with you. Though, things that happen during the party that are not super time consuming (MC, for example) we will see if we can find people to help. I agree with Meg that it's important for people to be able to party. The only jobs that happened during the reception were 1) fajitas cook (but he was cooking right in party central) 2) The MC who only had to announce our first wedding dance and 3) The photographers, but there were three of them, so they didn't feel too much pressure to capture everything. We actually hired the owners of the B&B to heat up the food we had cooked earlier, set it out, refill it, and clean up. Since we rented out the whole place and then charged everyone $25-$35 for their rooms, we had a little money left over that was used to pay Cathy and Cory (we paid them $50/hour for six hours). When my fiance and I get married in a year I want our wedding to feel special and not like a big show. We can't afford a big over the top wedding. 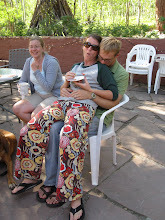 So for our wedding we plan on using family members to help us out. I personally think it would be special to us. For the wedding, I want to have a desert table. So guest can chose their own desserts. I will have a cake but I also want certain family members of mine to make homemade cookies. I love homemade cookies! My fiance and I also plan on having alcohol at the wedding. To rent a bartender is expensive. So I plan on using family members of mine who don't really want to dance to be the bartenders. I think it's a great idea! I also know people who own professional cameras and take really good professional photos. I have decided that I want to recruit them to be photographers at our wedding. Getting family members to help out with the wedding actually excites me. I'm excited to plan this wedding because I know it's going to be a great event. I think by recruiting family to help with the wedding, we will be saving lots of money. Not only that our wedding will feel special and we will have loads of memory's to always cherish.